Krang has come up with yet another brilliant plan to free the Technodrome. The evil alien sends Bebop and Rocksteady to kidnap Buffy Shellhammer, 15 year-old CEO of Shellhammer Chemicals. Buffy has the secret formula for a super rocket fuel which Krang needs to get the Technodrome moving again. Michaelangelo falls heads over heels for Buffy when he sees her on TV with April. 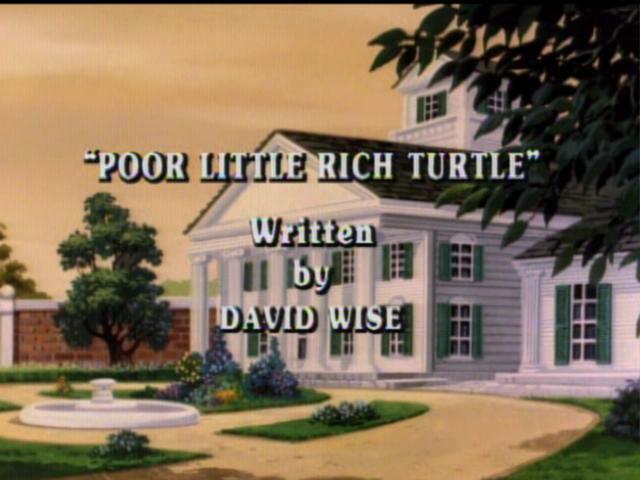 He convinces the Turtles to go to her mansion so he can get a glimpse of her. The TMNT get there just as Bebop and Rocksteady arrive. The Turtles fight them off and rescue Buffy. Our heroes decide to bring the millionairess to April’s apartment until they can figure out why it is that Shredder wants her so badly. Bebop and Rocksteady follow the Turtles to April’s apartment and grab Buffy, bringing her to the Technodrome. In the Technodrome, Shredder tries to force the formula out of Buffy, but fails. He shrinks her and tells her that she will stay that way until she gives him what he wants. Back on Earth, the Turtles find out from April why Krang and Shredder want Buffy. They realize she is in great danger, but they have no way of helping her because their trans-dimensional portal is not working. Buffy finds a way to reach the Turtles from the Technodrome and transports them to Dimension X. Shredder gets one last attempt to get the formula from Buffy by threatening to get rid of the Turtles. She gives in and tells him the formula. The Turtles change Buffy back to her size and all five of them return to Earth. Krang tries the formula that Buffy gave Shredder and finds out that she gave him a formula for making fireworks and not the rocket fuel.